Memorials: The Church of God General Conference/Atlanta Bible College (2020 Avalon Parkway, McDonough, GA 30252) or to Faith Hospice – Trillium Woods Patient Assistance Fund, which supports patients in need of benevolent care (2100 Raybrook St. SE, Suite 300, Grand Rapids, MI 49546). Joyce Lorraine Knapp (89) passed away peacefully on Wednesday, December 12, 2018. She was born February 7, 1929 in Middleville, MI to Lynn F. and Bee Slocum, and is survived by one sister, Gloria L. Prak of Decatur, MI. While living in Grand Rapids, she met and married Charles E. Knapp in 1950. They were blessed with four children: Steven C. Knapp (Norma); Lynne M. Krogh (David); Paula L. Knapp (deceased); Janice K. Mawson (Thomas) as well as six grandchildren and eight great-grandchildren. 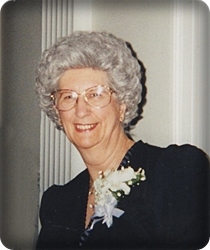 During her lifetime, Joyce touched many lives through her dedication and service to God and was one of the co-founders of Garden Park Church of God in Kentwood, MI. She also provided financial support in order for other churches to be built throughout the world, served in various church positions, as well as on the Sunday School Board of the Church of God General Conference. She was known as “Grandma Joyce” by many children through her years of volunteer work at Brookfield Elementary School, and to anyone who just needed a grandma figure. The family will hold an open house in memory of Joyce on Sunday, December 16, 2018 from 3:00pm to 5:30pm at the Garden Park Church of God (5615 Madison Avenue, SE, Kentwood, MI). Joyce was often heard saying “you cannot out-give God!” In lieu of flowers the family requests that donations be made to either the Church of God General Conference/Atlanta Bible College (2020 Avalon Parkway, McDonough, GA 30252) or to Faith Hospice – Trillium Woods Patient Assistance Fund, which supports patients in need of benevolent care (2100 Raybrook St. SE, Suite 300, Grand Rapids, MI 49546).